The workbook contains two sheets. One is a sample of my model and the other the BMA model. I have set the BMA model to P & I advanced. In other words, there is a guarantee of principal and interest to the buyer. Both models use the same inputs as below. The calculations below are for the first month’s payment only. As I pointed out in my last post, my model uses a sequence of principle paydowns starting with the expected amortization, then prepayments, then defaults and loss severity. Each amortization paydown is dependent upon the calculation of the amortization that precedes it. The BMA model is also sequential. In this model, defaults are calculated first. Actual amortization needs defaults before it can be calculated. Prepayments need the expected amortization derived from the amortization factors. The calculations from the amortization factors mimic my calculations of needing the actual amortization first. Note that prepayments for the first month are the same for both models (in blue). The purist that argues that defaults should come before expected amortization and prepayments, should also insist that prepayments come before expected amortization, which the BMA model does not. 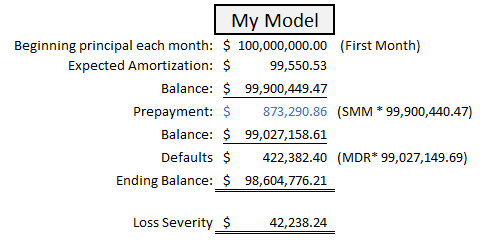 Prepayments in the BMA model are calculated after expected amortization, as does my model. In fact, if you set default to zero in both models, they amortize exactly the same. Default models are primarily used to predict credit risk. They are only as good as the users inputs. Although my model does not conform to the industry standard model, I continue to feel my model can be a useful tool for users that are not required to use an industry standard. Assumptions Behind The Default (CDR) Model.